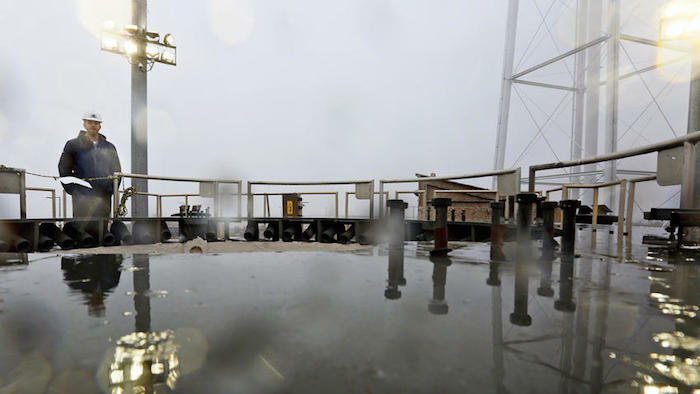 WALLOPS ISLAND — Dale Nash, head of the Virginia Commercial Space Flight Authority, stood between a newly repaired launch pad and the roiling, wind-whipped waves of the battleship gray Atlantic. "We're standing in the middle of the crater right here," Nash said. "It was about 30 feet deep and 50 to 60 feet in diameter. It blew this up and over. It tore up the stairs. It cracked that wall. ..."
Nash was recounting $15 million in damages inflicted on Virginia's $120 million spaceport when an unmanned Antares rocket exploded and crashed to the ground seconds after liftoff on its way to resupply the International Space Station in October 2014. 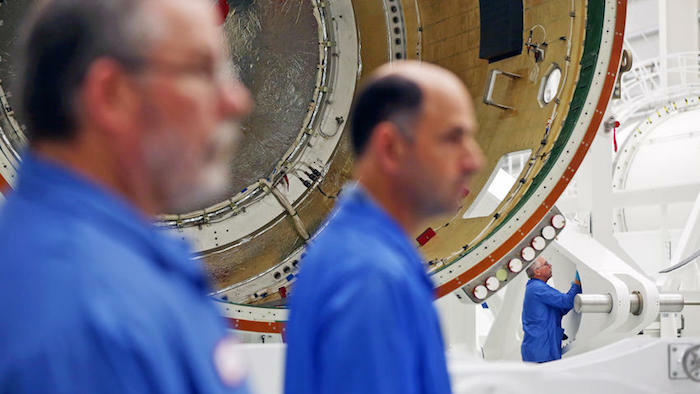 But Thursday morning he also was touting a host of major and minor repairs completed just last month — repairs and upgrades that finally render the state-owned Mid-Atlantic Regional Spaceport open for business again. 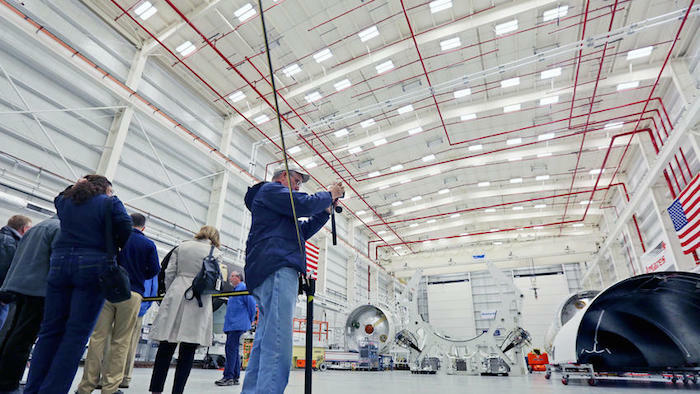 "It's as close to a brand new pad as when it was built," Mike Pinkston, a general manager for Dulles-based rocket-maker Orbital ATK, told a group of journalists. 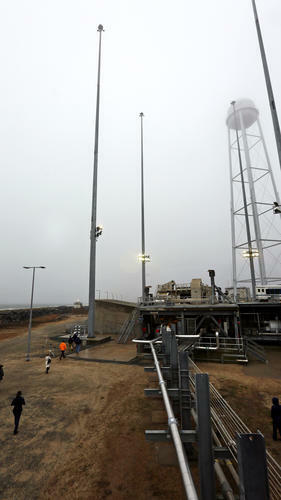 Bill Wrobel, director of NASA Wallops Flight Facility, called the work a "fabulous effort." The spaceport is located at the NASA facility. "It's been a monumental task, putting this back together," Wrobel said. And it signals that space station missions from Virginia could resume as early as next May with an upgraded Antares, Pinkston said, with yet another MARS launch from Virginia next fall. 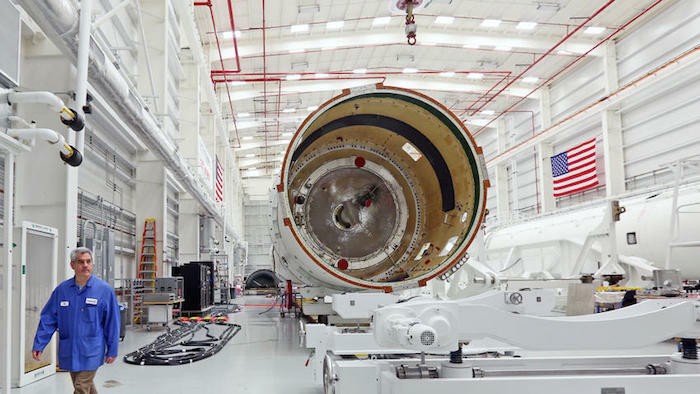 Orbital expects to make still another launch from Cape Canaveral, Fla., early next year using an Atlas V rocket. And those three missions will wrap up Orbital's $1.9 billion commercial contract with NASA to resupply space station astronauts. Thursday's media tour to unveil the new launch pad was announced just one day after Orbital successfully launched one of its unmanned Cygnus cargo spacecraft from Cape Canaveral — to the relief of NASA and the commercial space industry. Orbital had contracted with the United Launch Alliance to use an Atlas as an interim booster while it replaced the engines in its Antares. 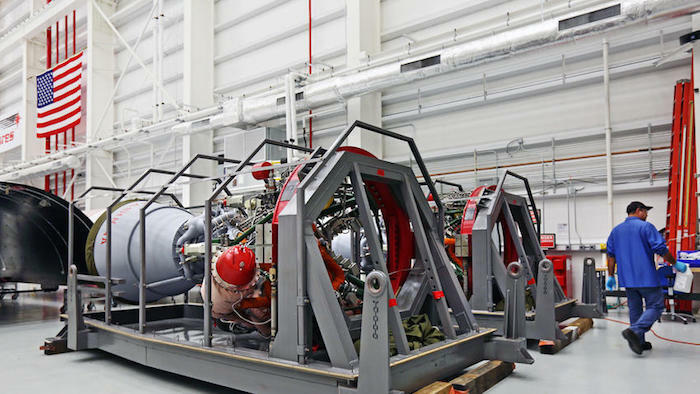 Two Antares rockets are being assembled now in the Horizontal Integrated Facility at NASA Wallops. One rocket already has two new Russian-made RD-181 engines integrated in its first stage in preparation for a hot-fire test on the new pad in March. If successful, Pinkston said, that rocket will be refurbished for the fall launch from the Mid-Atlantic Regional Spaceport. The second Antares hasn't had its engines integrated yet, but that's the rocket Pinkston says is set for a spring mission. 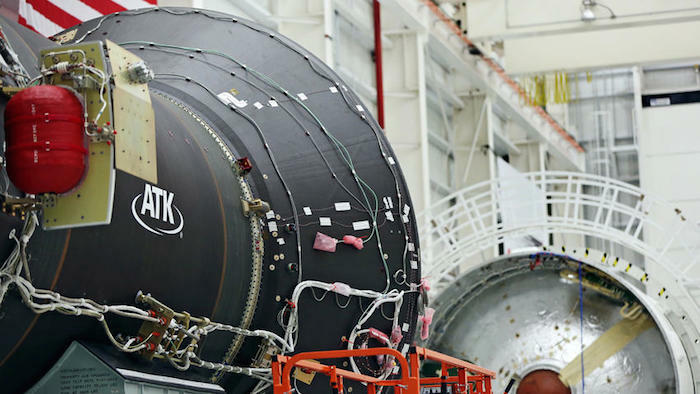 New engines are key to the Antares upgrade. Orbital blames last year's rocket failure on a faulty turbopump bearing in one of the rocket's first-stage engines. The company already had made two successful operational missions from Virginia with the Antares, as well as two demonstration launches, before that third operational mission ended in catastrophe. The RD-181s, Pinkston said, are "as close to a drop-in replacement as you can get." "These are brand new, one-owner, fresh-off-the-production-line engines," Pinkston said. They also have greater thrust and 25 percent more cargo capability, he said. 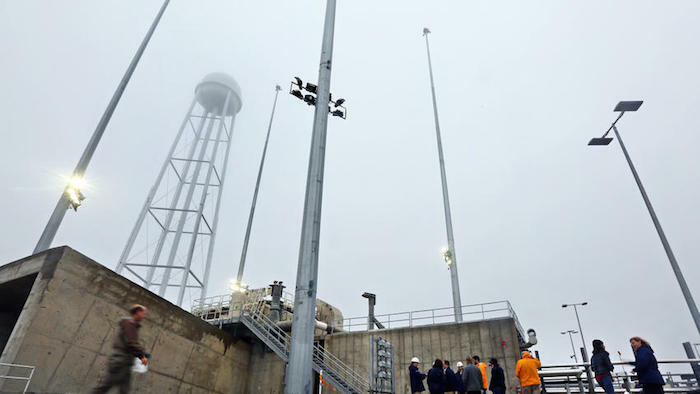 NASA says restoring launch capability from Wallops is "critical to furthering NASA's and the nation's goals in space" as well as maintaining the space station as a springboard to deep space exploration, such as missions to an asteroid and to Mars. As the next space launch from Virginia approaches, Pinkston said the "confidence level is high" for a successful mission. "This one's going to work," he said. 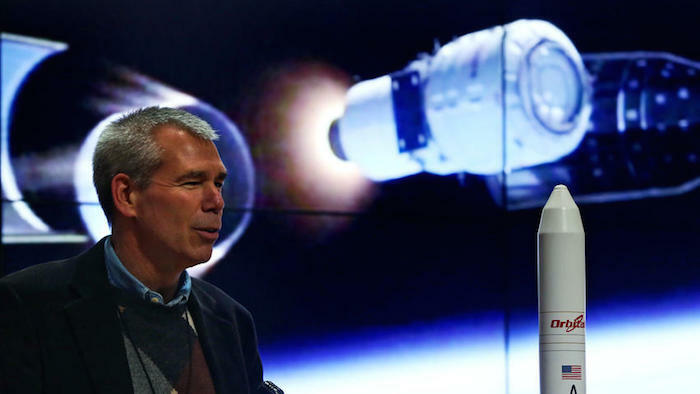 Director of NASA Wallops Flight Facility William Wrobel says a few words about the recent renovations after a rocket explosion back in October 2014 during a media day at NASA Wallops in Wallops Island on Thursday, Dec. 17, 2015. Vice President and general manager of Antares Mike Pinkston talks about the improvements and renovations made after a rocket exploded in October 2014. Virginia's spaceport at NASA Wallops is completely ready for launch in the coming year. Thursday, Dec. 17, 2015. 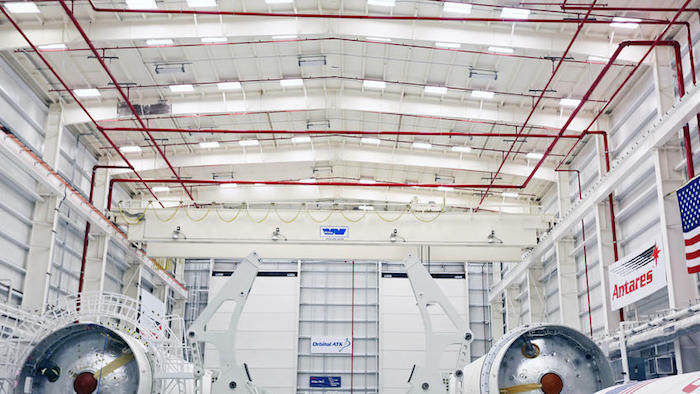 Seen is the inside unit where the Antares rockets are stored at the Virginia's spaceport at NASA Wallops in Wallops Island on Thursday, Dec. 17, 2015. 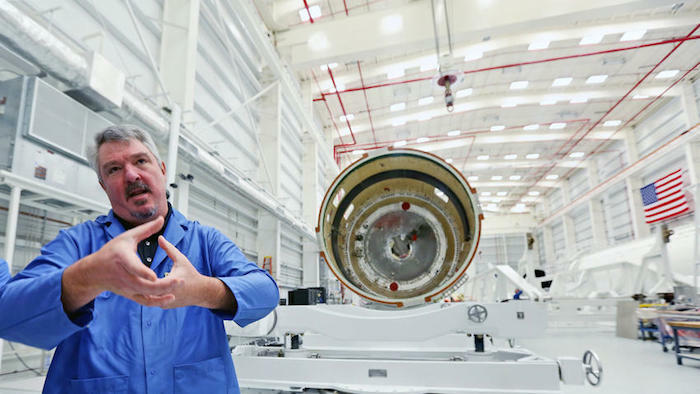 Jim Ricca from Salisbury takes a photograph during a tour of Virginia's spaceport at NASA Wallops in Wallops Island on Thursday, Dec. 17, 2015. Seen is the second stage rocket motor which is housed at Virginia's spaceport at NASA Wallops in Wallops Island on Thursday, Dec. 17, 2015. A tour group walks behind the launch pad at Virginia's spaceport at NASA Wallops where parts of the rocket landed after an explosion in October 2014. The port has been renovated and will be ready for launch in 2016. A technician walks past a large part of a dissembled rocket while it's housed in the horizontal integration facility at Virginia's spaceport at NASA Wallops on Thursday, Dec. 17, 2015. A technician works on a rocket at Virginia's spaceport at NASA Wallops at Wallops Island on Thursday, Dec. 17, 2015. A tour group stands behind the launch pad at Virginia's spaceport at NASA Wallops where parts of the rocket landed after an explosion in October 2014. The port has been renovated and will be ready for launch in 2016. Director of Mid Atlantic Regional Spaceport Sean Mulligan stands along the launch pad where an Antares rocket exploded in October 2014. 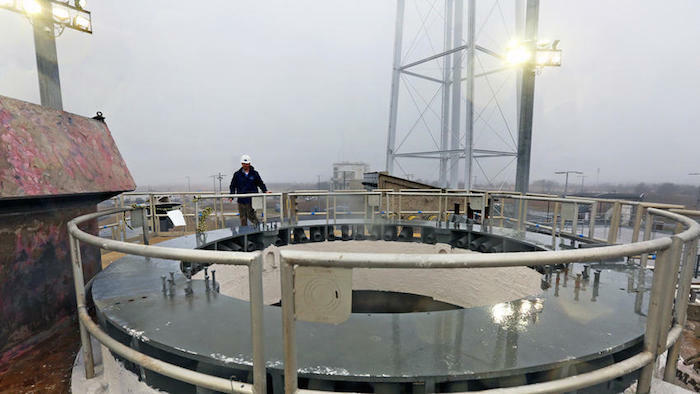 The Virginia's spaceport at NASA Wallops has been renovated after the explosion and is ready to launch in the upcoming year. Thursday, Dec. 17, 2015.